This morning I dropped off Franny at her dad’s for the weekend. Her dad doesn’t observe Easter and she was concerned that the Easter Bunny would pass her by. Despite her father, being the child-centered fellow that he is, telling her early on that neither Santa, the Easter Bunny, nor the Tooth Fairy exists, she continues to “believe”–at least at my house. Her stepbrother, Kevin, is also returning to his mother today. Kevin’s mom does observe Easter, but Kevin is hoping for a double-header. So I suggested he and Franny craft a letter to the Easter Bunny requesting that he/she deliver baskets to be opened upon their return. I have found that a polite reminder is also effective when the Tooth Fairy forgets to leave money under the pillow. 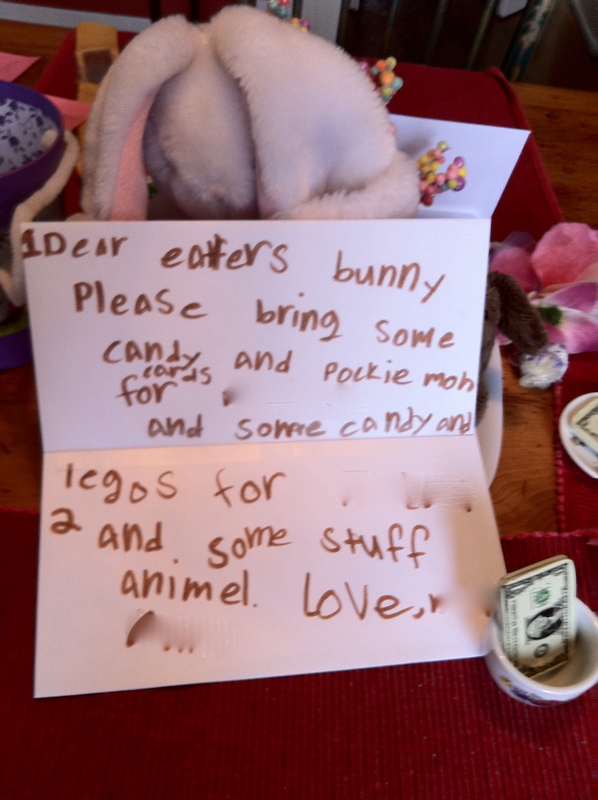 The kids penned a note asking for candy, Pokemon cards, and stuffed animals, and left it by the Easter Bunny centerpiece they had arranged on the breakfast room table. She shot me a I’m-onto-you-but-I-don’t-want-to-spoil-the-magic look. “Any kind,” she said with a grin. I’ll be keeping that in mind now as I hop on over to Target. Awwww! Please give your daughter a big Easter hug from me. Mine is getting dropped off soon for Easter celebrating. Have fun presenting the basket. And, Happy Easter! i keep coming back don’t i.
i think u missed my reply to your first post in february, it might help clarify. maybe. and yes, something about reading your words is comforting, in a connecting with a complete stranger-not feeling so alone in the world kind of way of course. We do prEaster (Pre-Easter) at my house on the years the kids aren’t here (Although my Ex still has Easter for them… I can’t believe your Ex does that to her!). What is wrong with these people? Seriously? My ex and his wife told my 8-year-old this year that Santa was but a figment of her imagination. I’m with you: Despite the knowing looks from children who know better (but shouldn’t), I keep on keeping on with my sacred traditions. Screw ‘em! I do hope you enjoyed your Easter…and I’m sure she loved her stuffed animal!